My history with southern food is very fake and touristy. When I was little, we lived in The South*, and I like to imagine my earliest meals were all jambalaya and grits, but I'm pretty sure it was more like pbj and fried bologna. I have no legitimate recollection of southern food. 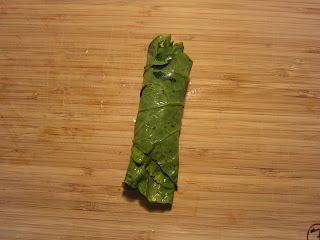 I try to cook something cajun-ish each Fat Tuesday, but that started in adulthood. As an adult, I was introduced to southern food in two great pretend situations. The first was on a business trip, when I was in my late teens. This may even have been pre-Sous Chef Brian. certainly 21 years old. A group of us, 20 or more, went to the fanciest dinner out I'd ever had at the time, at Justin's. Yes, that's Sean 'P. Diddy' Combs' restaurant. He was still Puff Daddy at the time. The drinks were flowing, and I was a grown up, on my first big business trip. I don't recall what I ate, but I remember thinking I was a big fan of soul food. I probably had the popcorn shrimp. A few years later, Sous Chef Brian and I went to Las Vegas on our honeymoon. In a city where everything is fake, in a week of gondola rides and obligatory time-share presentations, we went to the House of Blues for the "gospel brunch" and ate catfish and collards while people sang and clapped and praised. I loved catfish. 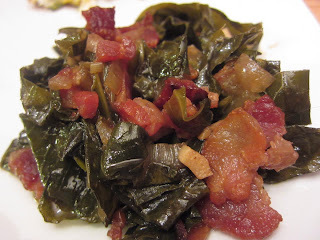 I loved collards. When I came home, several people explained to me the role of catfish in the ecosystem. Feel free to Google that for yourself. So that's out**. 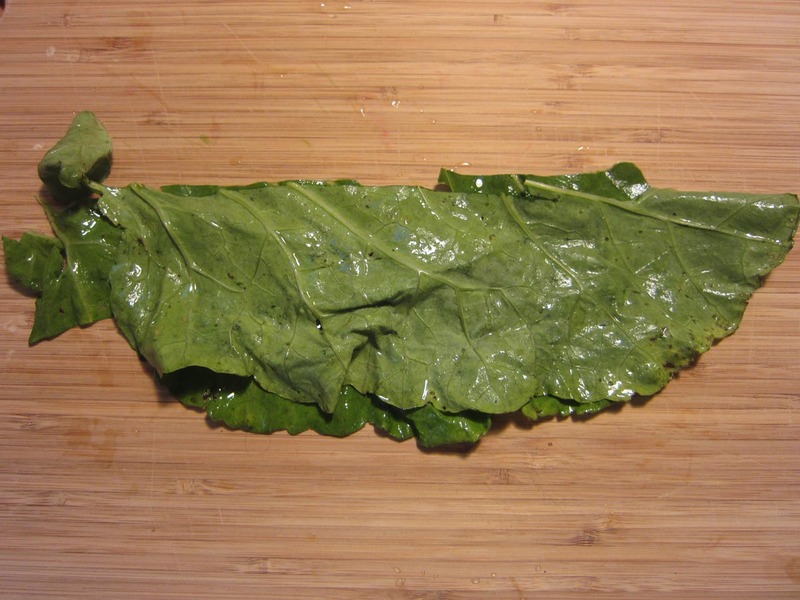 But collards, collards stay. Sous Chef Brian and I "celebrated" our wedding anniversary last week. "Celebrated" in that we had head colds and ate matzo ball soup. But a few days later, I was feeling good enough to make collards, very likely right about on the anniversary of the first time I tried them. Unintentionally though, I really don't have that sort of relationship with greens. I've referenced this recipe before - I made it as part of a larger meal, and made something very similar with chard for pizza. I de-stem them and then wash them, because I think the stems are too bitter to add to my stock bag, so they just go into the trash, or compost, or whatever. Washed, folded in half and stacked flat. 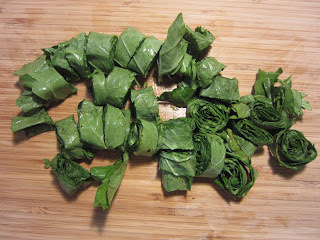 It may seem like an aesthetic decision, but there is something important about slicing them into ribbons. I don't know, it affects the texture. It's important. 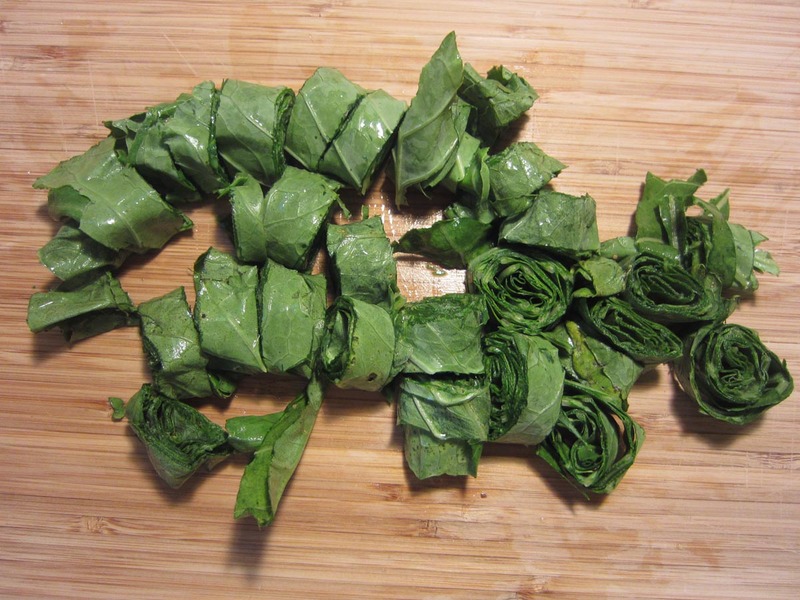 Do that to a whole head of collards. Meanwhile, get some bacon going. 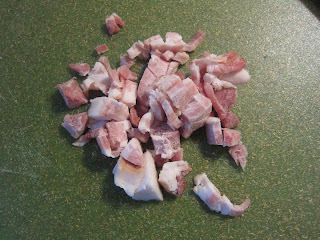 This is 2 ounces of bacon, cut up a bit. Remember, this is not meat, as bacon is a seasoning. Render that in a saute pan. 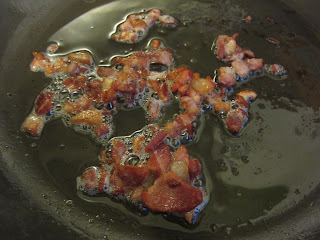 And when the bacon is about crisp, set it aside and keep the grease in the pan. 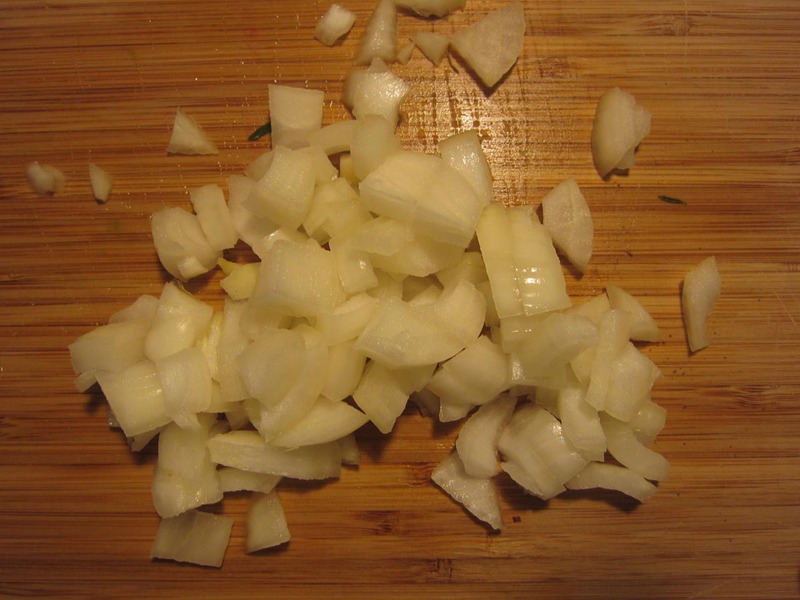 Dice up a small onion. 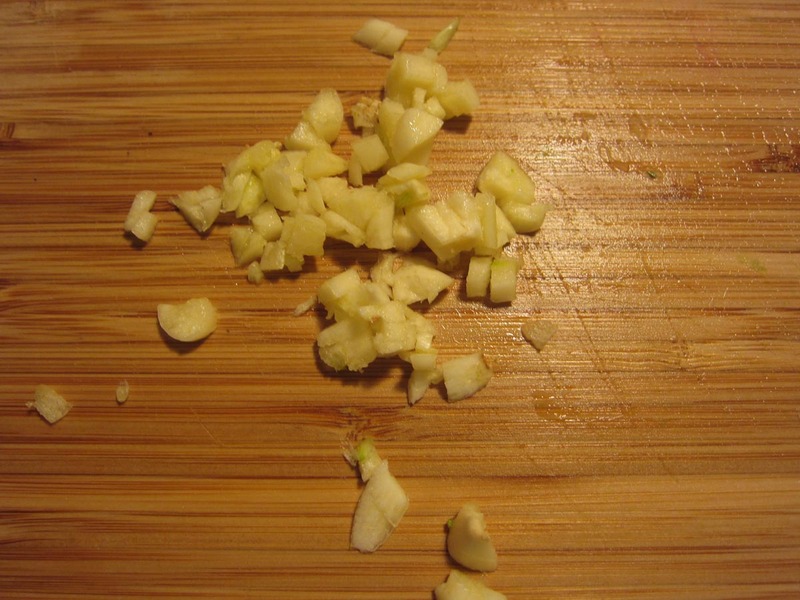 And several cloves of garlic. 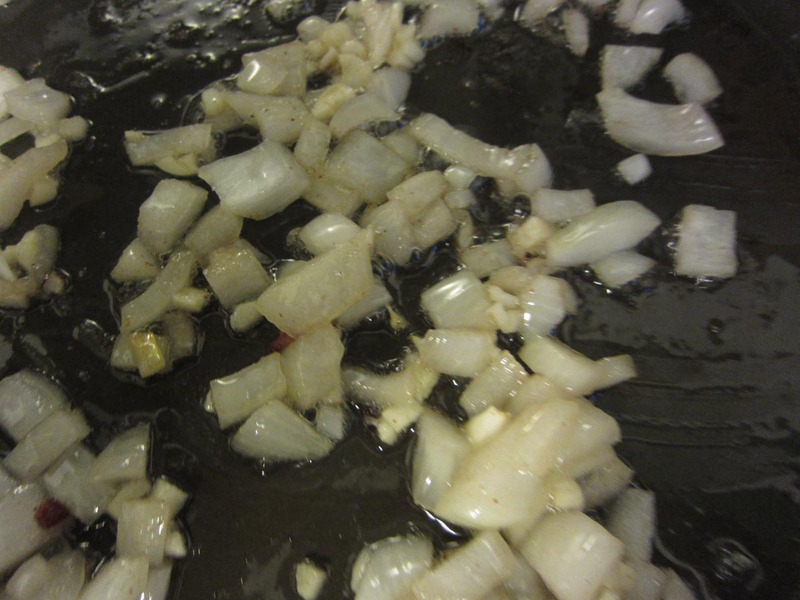 Get the onions translucent in the bacon grease, then add the garlic. When everybody's fragrant, add the collards. Scooch them around and get them coated in the bacon fat. 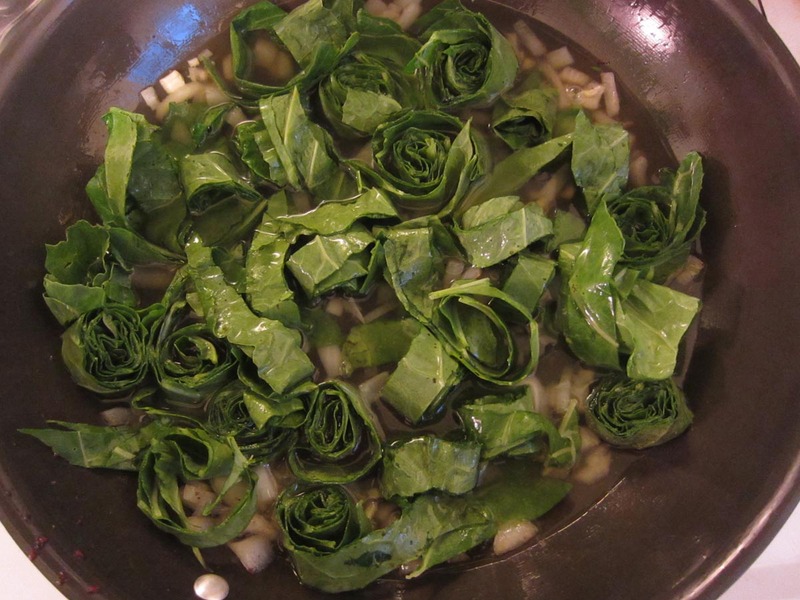 Once they've started to wilt, add stock. I use veg stock here, because that's what I use, but chicken stock would be good too. 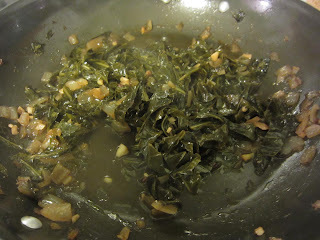 I do enough stock to cover the bottom of the pan and about halfway up the greens, and I keep it at a simmer, adding to the liquid for the first 40 minutes or so to keep the level steady. Other people cover the greens in liquid. After a while, and I'm saying 40 minutes here, but food will be food, they'll look almost done. They are not almost done. Put one in your mouth. Still a bit crunchy. You want them to be silky. Let's add flavor. 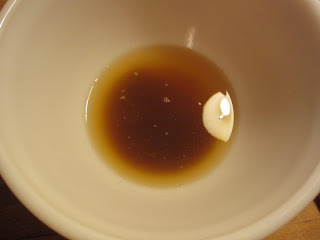 A half cup of apple cider vinegar with a teaspoon of brown sugar dissolved in it. Volume in bowl is greater than it appears. Also, hot sauce. To taste. 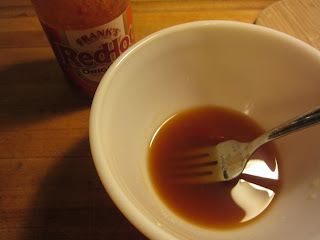 At this point, don't add more liquid, other than the vinegar and hot sauce and sugar mixture. Simmer uncovered. Maybe another 20 minutes? When they're velvety, they're done. Add the bacon back in. Dish them out using tongs or a slotted spoon. Other folks will tell you that the "pot liquor" left over is the best part. You can make soup or gravy with it. I don't do that. 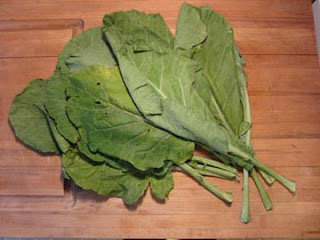 One small bunch of collards - like 10 leaves - is about two servings in my mind. I served it with baked and breaded tilapia*** and some afterthought mac and cheese****. **farm-raised catfish and wild catfish are two different things. ***we're not fish people, nevermind the catfish story from earlier. 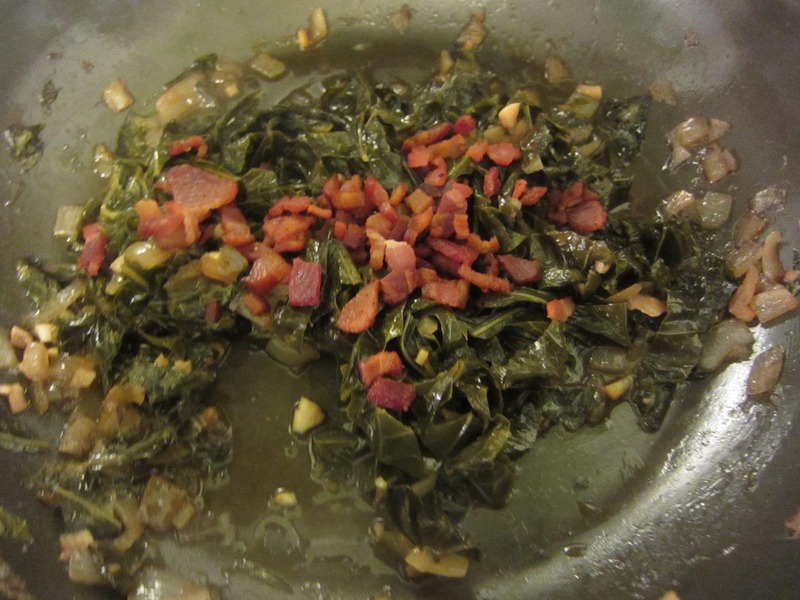 So when I make fish I make rich sides, like say, collards and bacon. And I don't have fish recipes because I don't like fish. The time when I make fish and think, "This fish is incredible!" is the time when I'll post a fish recipe. 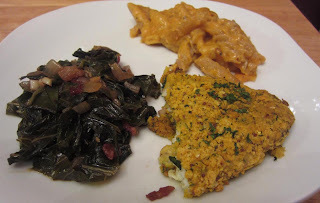 ****afterthought mac and cheese, like when the collards are nearly done and it's time to put the fish in, and you think, "Wow, we really don't like fish," that's when you whip up a small dish of 25-minute mac and cheese. It's not awesome, but it's fine. 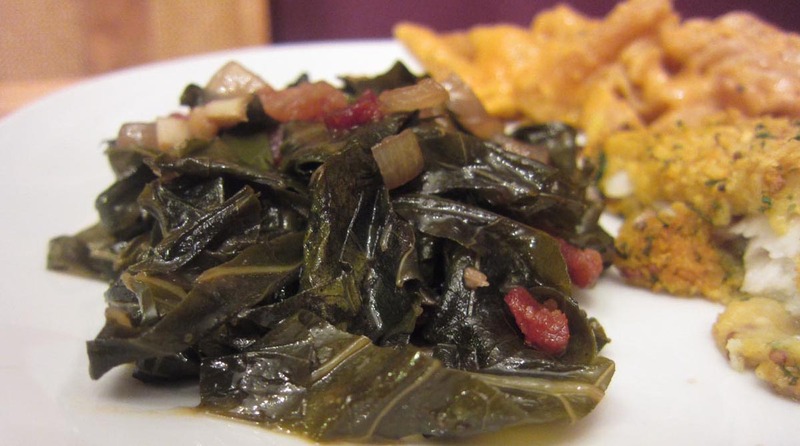 Southern-style collards with a buttery texture and a flavor that's tangy, salty, and sweet all at once. Also, bacon. 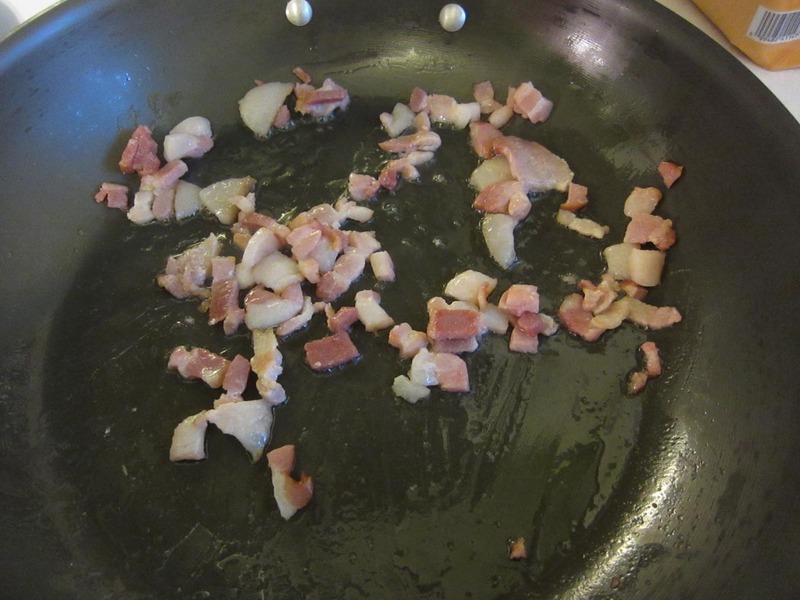 Cook the bacon until crisp, reserving fat in pan. 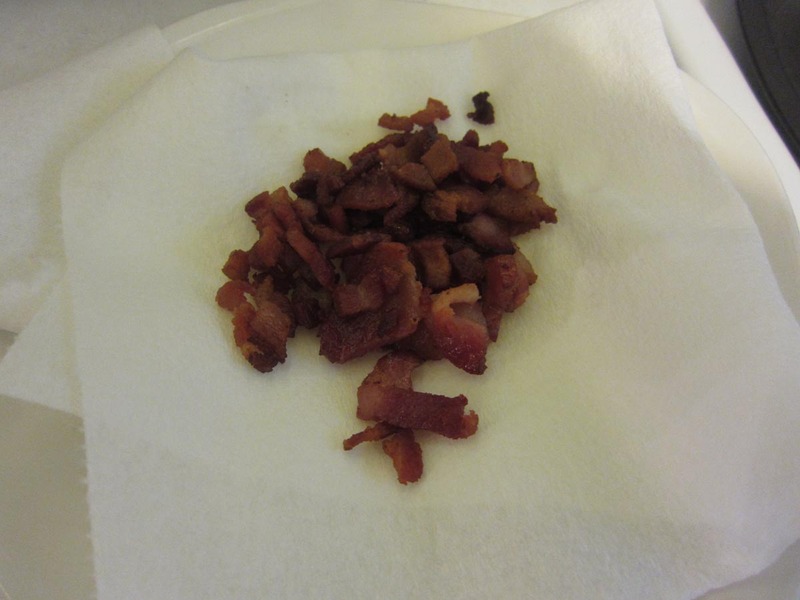 Remove bacon to paper towel and set aside. Remove stems from collard greens. 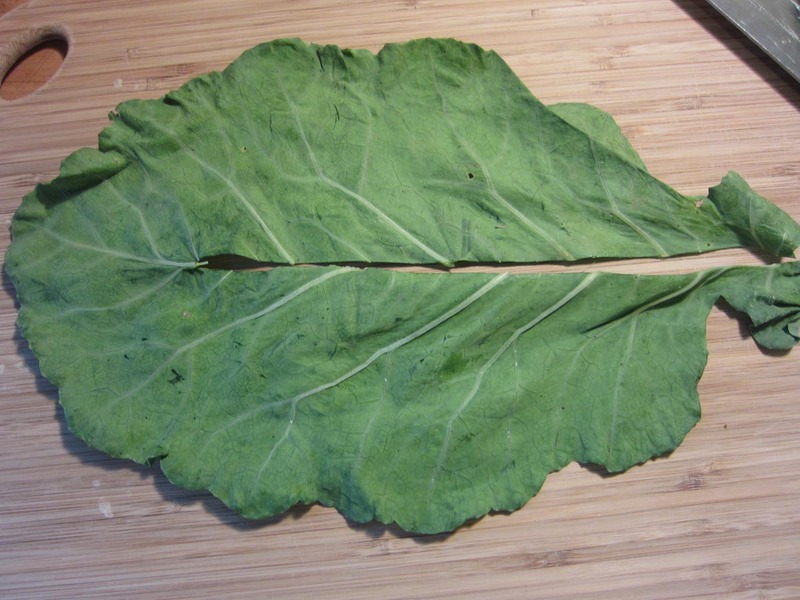 Wash greens and fold in half. 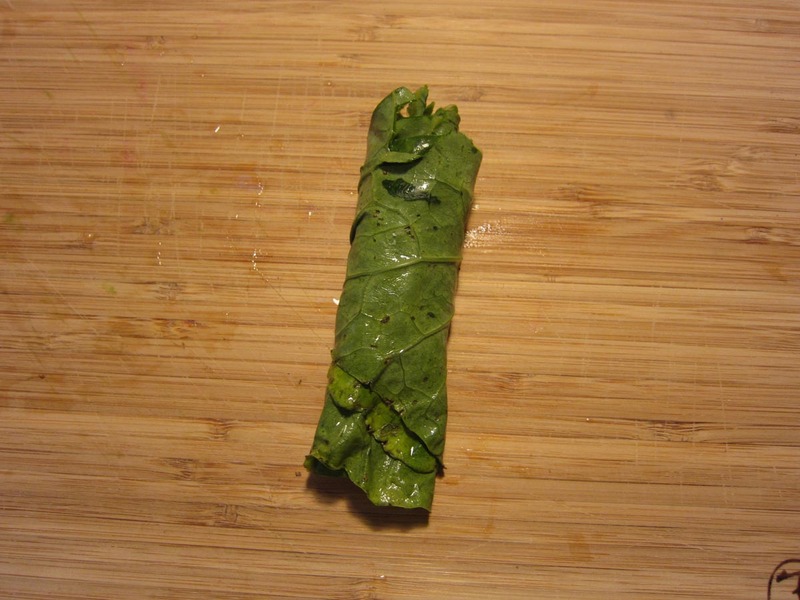 Stack several leaves and roll up. 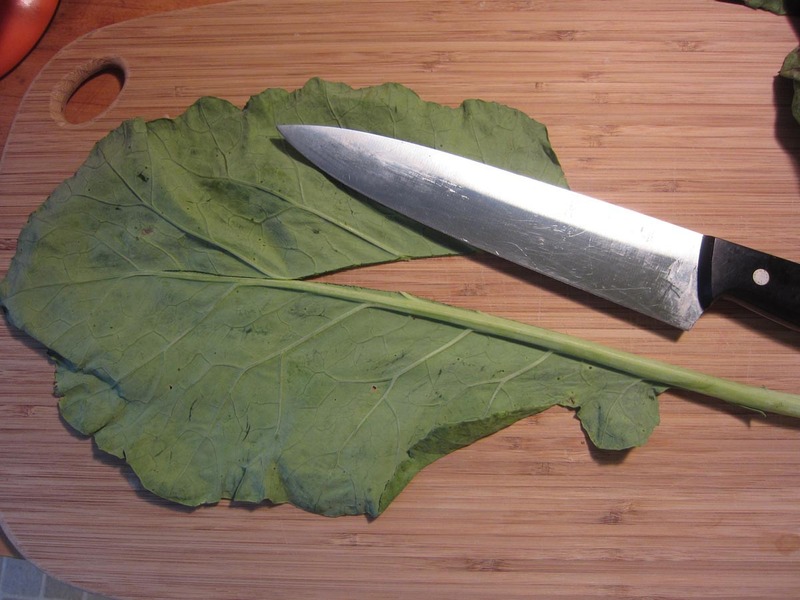 Slice into 1/2 inch rounds. Add onion to bacon fat and saute until translucent. 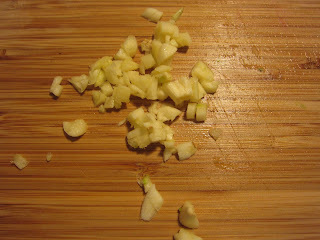 Add garlic and turn to medium-low. Add greens to pan, and toss with bacon fat. Add enough stock (vegetable or chicken) to cover bottom of pan and come half-way up the greens. Simmer medium-low, stirring occasionally, uncovered, adding stock as needed. After 40 minutes, mix together vinegar, sugar and hot sauce. 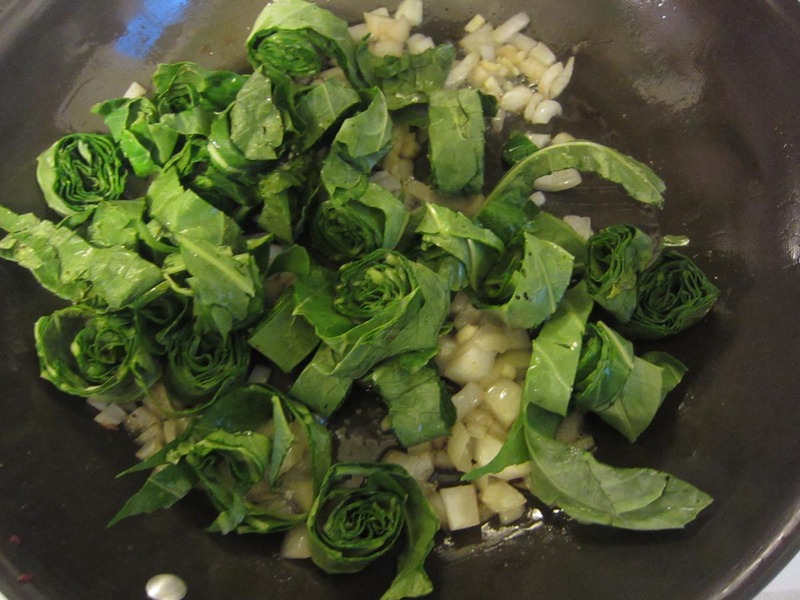 Add to greens. 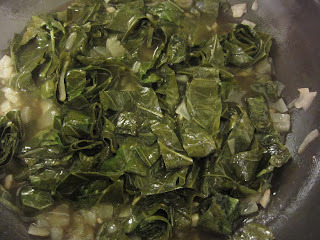 Simmer uncovered, no longer adding stock, until greens are very tender. Add bacon back to pan, stir to incorporate and warm through. 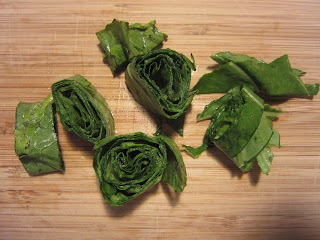 Serve with slotted spoon or tongs.